A business trip to western Turkey seemed like the perfect opportunity to visit an area I’ve always wanted to see: Cappadocia. 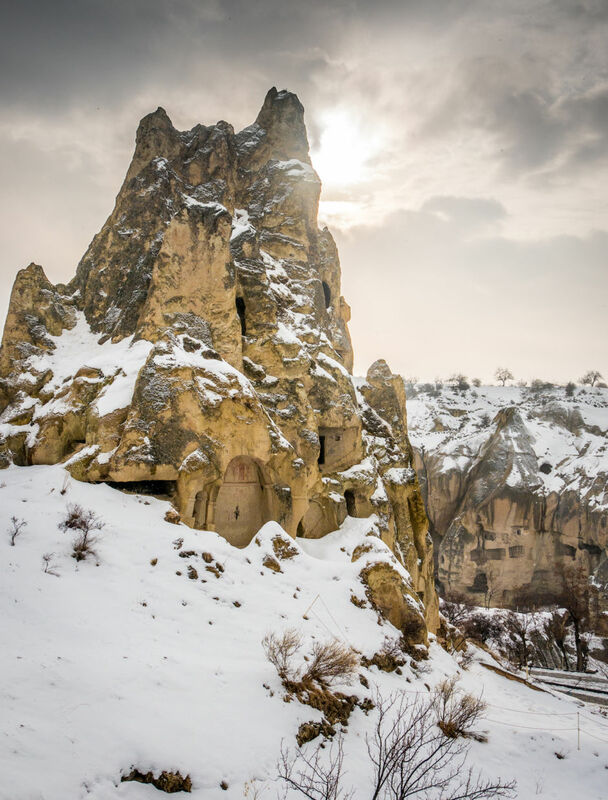 It’s a region in central Turkey known for bizarre landscapes where millennia of rain, snow, and wind have worn the region’s soft orangish rock down, creating an array of “fairy chimneys” and other novel geological formations. That same soft stone has enabled people for over a thousand years to develop a labyrinth of cave homes, churches, and even complete underground cities (some going eight stories deep beneath the earth’s surface). These hidden villages and places of worship protected the Christians who inhabited the region for centuries. You can still visit some of the elaborately-painted cave churches and observe how people created a way of life inside the rocky landscape. The only thing that seemed less than optimal about this opportunity to visit Cappadocia was the timing: my meetings were in January. No biggie, I thought. So, it’s a bit cold. How bad can that be? My flight to Kayseri (the largest city in the region) from Istanbul got turned back halfway due to a snowstorm. When I finally arrived, snow blanketed many areas. Then, the next day, another snowstorm hit. As a result, all of the hot air balloons you usually see in images of Cappadocia were grounded. The underground cities that lie further afield were inaccessible due to closed roads. Even the fairy chimneys and other formations I’d hoped to see and photograph lay coated in white. Most of my expectations for the place were crushed. Which, as is often the case, ironically makes for the optimal trip. 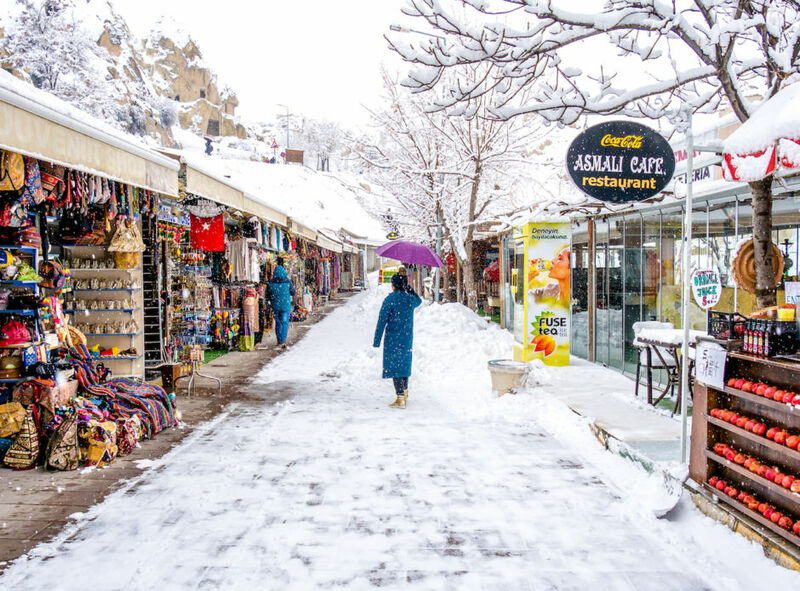 As surprising as it may seem, the snow and cold made Cappadocia in winter one of the best times to visit the area. Here’s why. When the world around consists of whites and shades of tan, a little color, like this door on the street where I stayed in Urgup, becomes a lavish sight. Even with some locations closed due to the weather, you’re still able to see many of the sights such as these Three Beauties (Uc Guzeller) in the Devrent Valley. The weather and lack of other tourists mean that locals are more willing to connect with you. 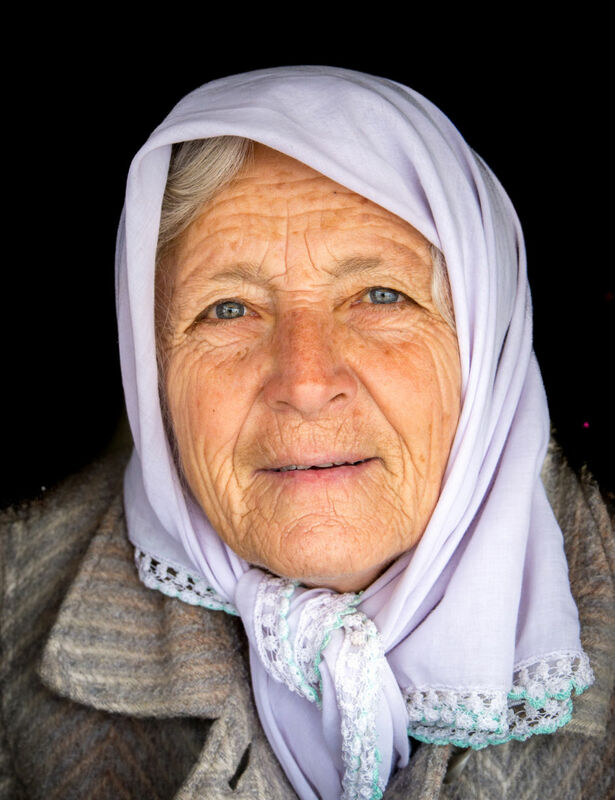 My guide introduced me to this lovely woman who sat in a small booth collecting parking fees in the town of Avanos. Had the weather been better, I likely would have spent more time visiting a wider range of places. Instead, I went deep rather than wide and discovered the backstreets of Urgup where I stayed, including scenes like this in the evening. The weather slows you down. 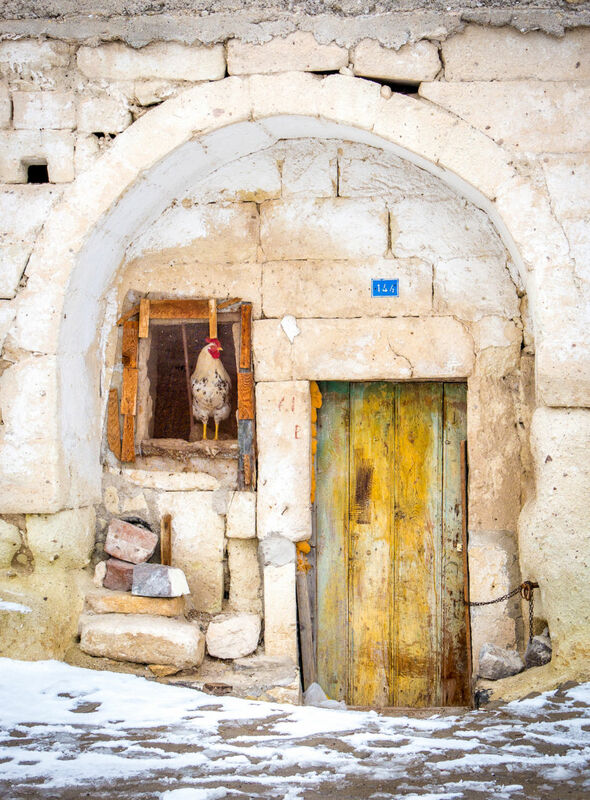 As a result, you notice more: like this unlikely location for a chicken in Nevsehir. 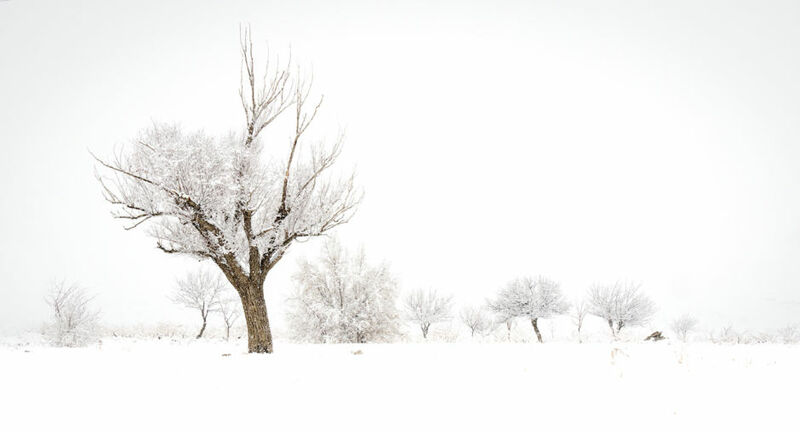 The snow and its muted colors help you appreciate anew familiar objects like this tree near Monk’s Valley. Probably the greatest benefit of traveling during the winter is that you have many places to yourself. We ran into a single busload of Chinese tourists. 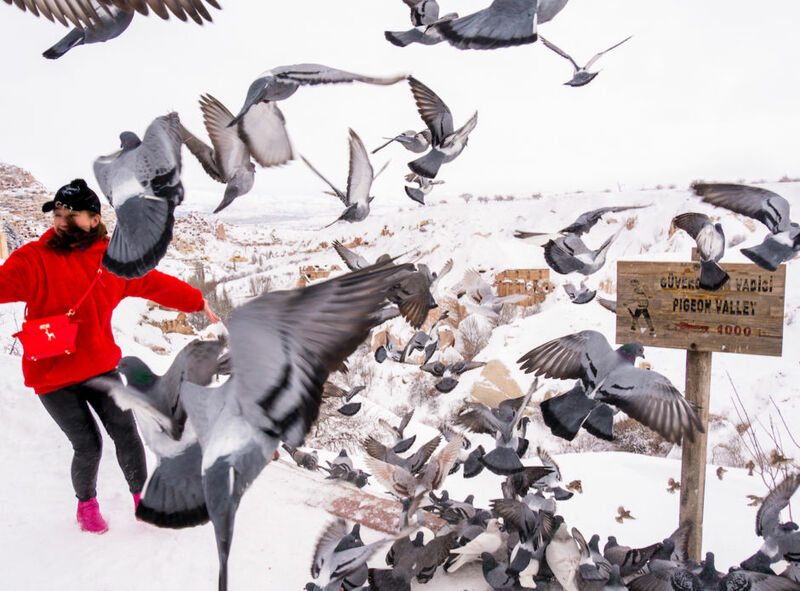 In this case, the woman’s bright jacket and attempt to emulate the birds brightened the scene here at Pigeon Valley overlooking the town of Uchisar. You don’t have to stretch your imagination to feel what it would be like to live here in the cold of winter. My wonderful guide, Mehmet, gives you a sense of the scale of these cave homes. At one of the cave churches in the Gerome Open Air Museum, I could take as much time as I wanted since few other people were there. 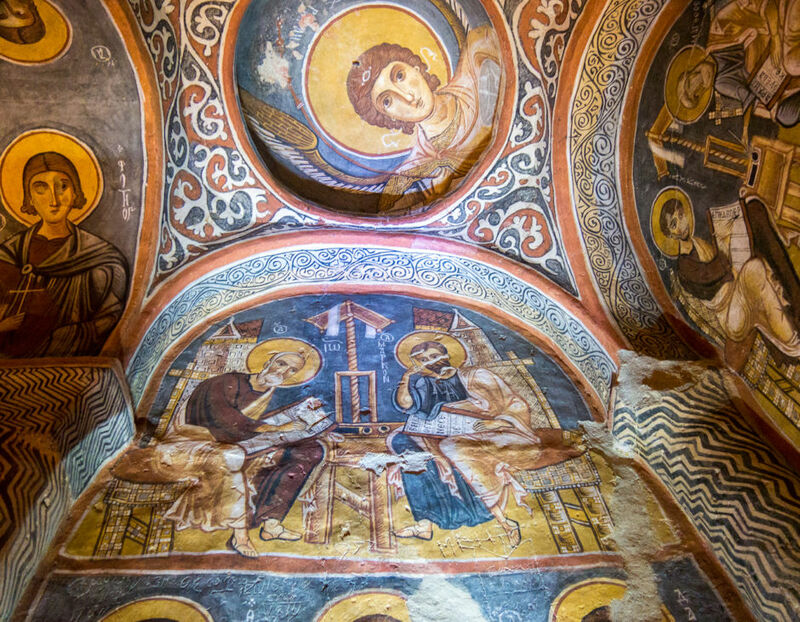 Many of the saints painted on these still-vibrant frescos have had their eyes scratched out not, I was told, from Muslims concerned with sacred images involving people, but from Greeks who once lived in the region. They believed that the eyes contained the power of the saints. They scraped the paint off the cave walls and mixed it in their tea in the belief it would make them live longer. 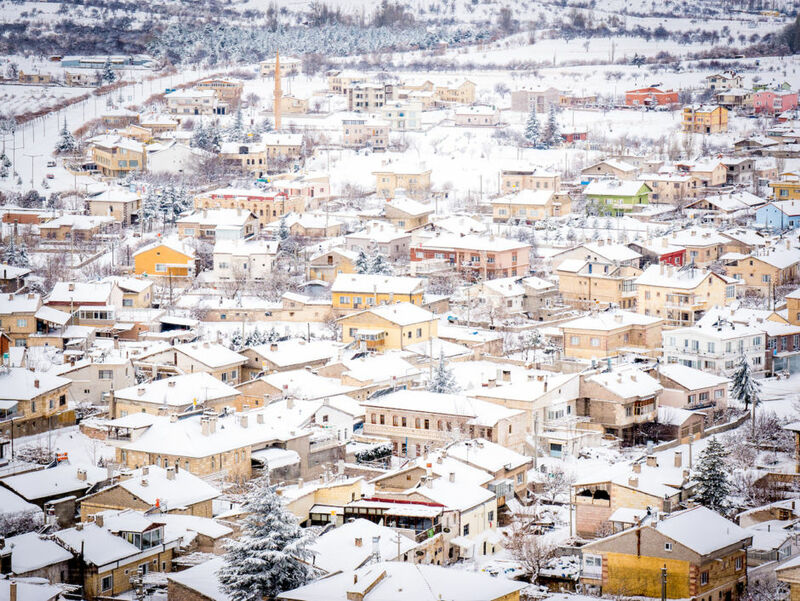 In another season, this view of the modern section of Uchisar would have been uninteresting. But all that white combines with the geometric patterns to create a strangely captivating scene. 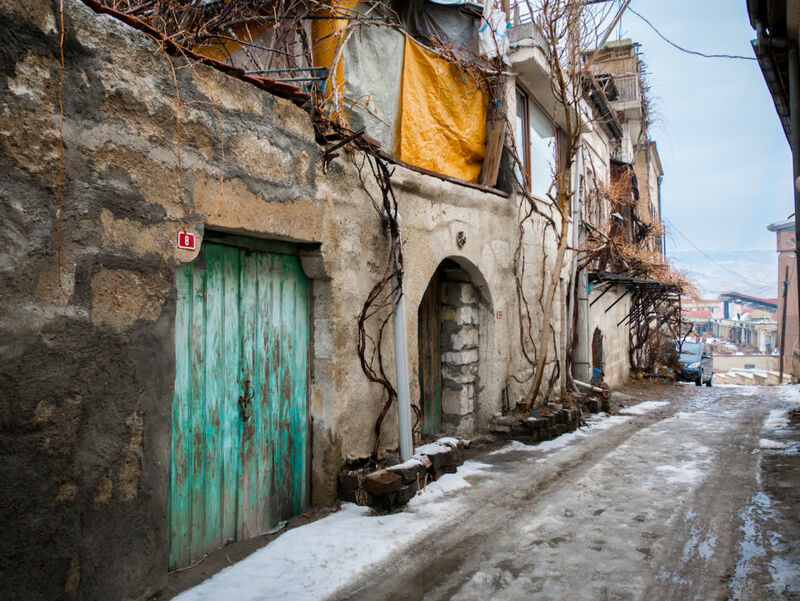 This section of Nevsehir would be intriguing in summer as well. But the snow increases the contrast, enhancing the complexity of the architecture and the inherent mystery of the place. 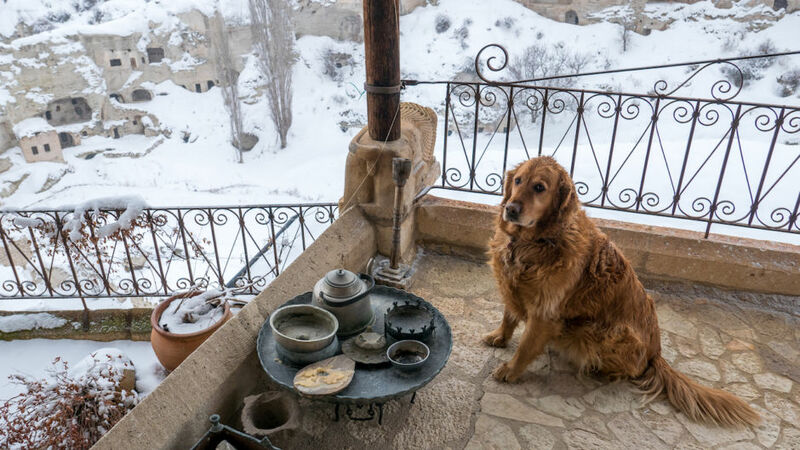 I was invited to spend an afternoon with one of the region’s most famous photographers at his home overlooking a picturesque valley seen in part here from his balcony. The weather slowed me down to focus less on scenery and more on what really matters: people. And their dogs. 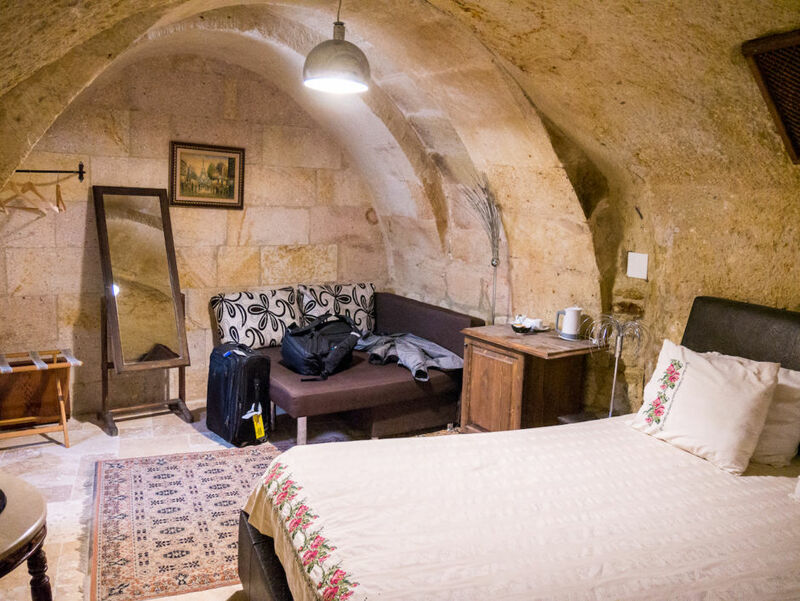 Most of the area’s hotel rooms (as well as many homes) are carved out of the soft rock. My host told me when I checked in that I might find sand on my bedspread since the ceiling of the cave occasionally sheds. I didn’t care. All I could think about was that I was sleeping in a cave. A CAVE! And a toasty warm one at that. 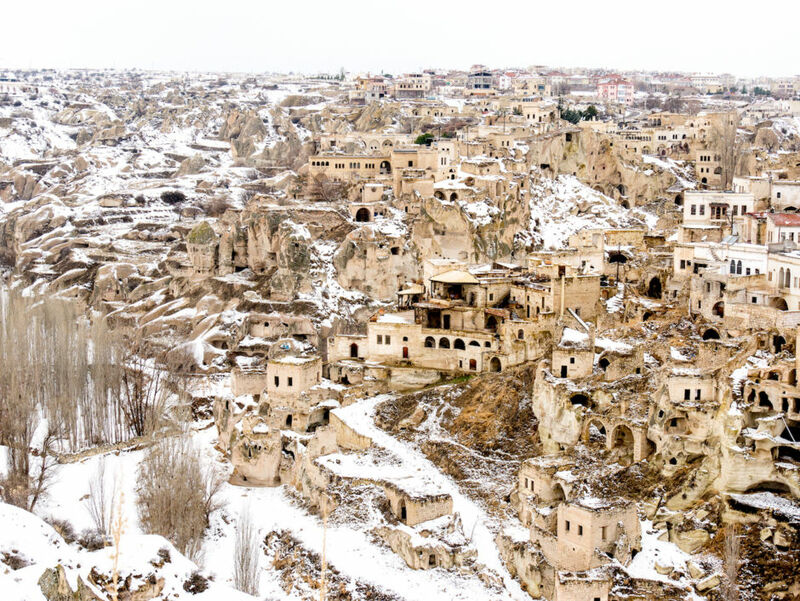 Everyone on Instagram who has been to Cappadocia seems to have the same shots because most come in warmer seasons. 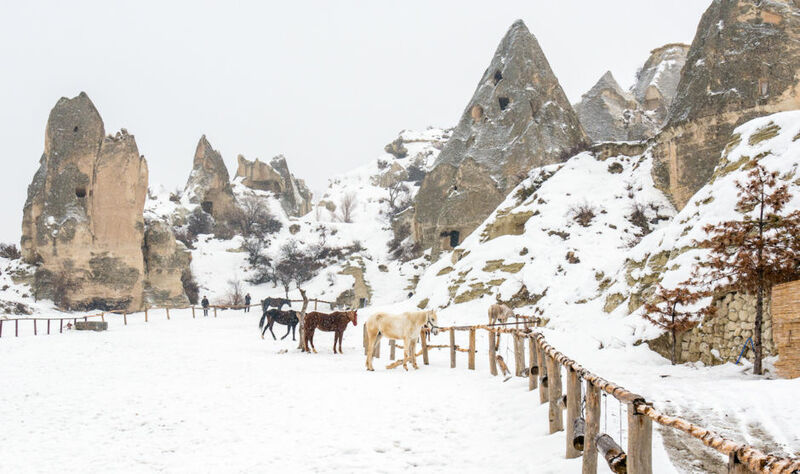 Being here in winter allows you to see the same scenes but, because of the snow, they look totally different such as this horse ranch near Goreme. My guide, Mehmet, was wonderful. Not only did he take me to great locations and have me over for dinner to meet his family, but he avoided going to souvenir stores just to get a cut, as many guides do. Instead, we visited places like this pottery studio where, due to the weather, we could stay warm, sip hot tea, and watch vessels being created and decorated. 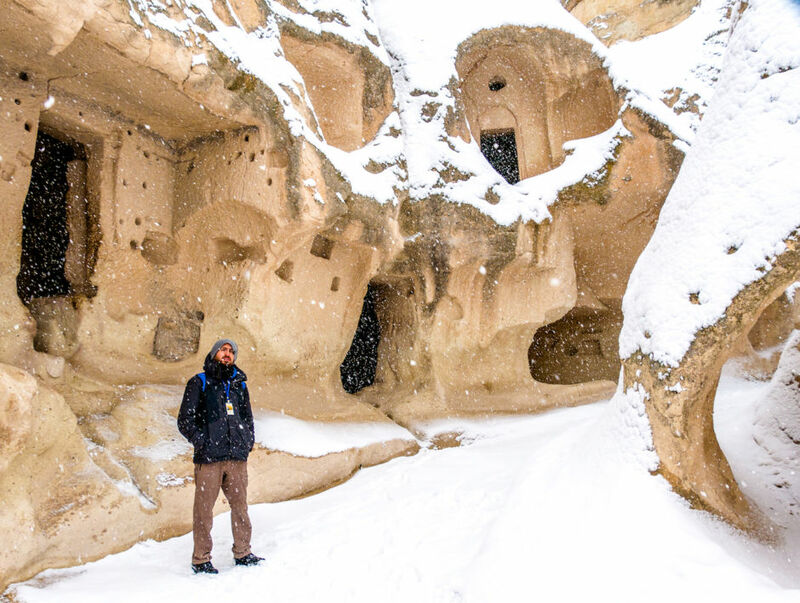 Maybe it’s just me, but in warmer seasons, I’d be out running around more, popping in and out of every cave here in Goreme trying to see it all. In the winter, I spent more time appreciating each painted cave wall and trying to understand what life would have been like for the monks and others who lived here centuries ago. I may not have made it out to the underground cities, but that allowed me to spend more time at places like this, the Goreme Open Air Museum, exploring the cave homes and churches.